The forest known as the Mata Atlantica (Atlantic Forest) in Brazil is one of the richest biomes in the planet in terms of biodiversity. It used to cover most of the coast of the country. But the process of brutal destruction suffered by the Atlantic Forest has been even stronger than that of the Amazon Forest, since the Atlantic Forest is located in the regions where the colonization and land exploitation processes not only began, but consolidated, from 1500 on. Today, with just 7% of its original surface area, the Atlantic Forest is the most threatened biome in the country. The coastal area of Parana, especially the Antonina and Guaraqueçaba municipalities, are among the most beautiful landscapes in this state located in southern Brazil, given that this is where the largest continuous area of Atlantic Forest in the state and the whole country can be found. That this is so is directly linked to the presence of traditional populations and their conservation practices. However, the survival of these populations is under severe threat from private initiatives in the region for forest areas appropriation for various ends. In this document, we focus on two of them in particular: The first is about carbon credits trade under the REDD mechanism, promoted by a Brazilian NGO, the Society for Wildlife Research and Environmental Education (Sociedad de Investigación en Vida Salvaje y Educación Ambiental – SPVS). 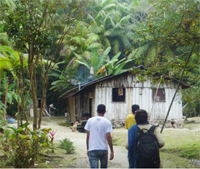 The second one is about forest and biodiversity conservation in the ‘Salto Morato Nature Reserve’ owned by the Boticario Foundation.